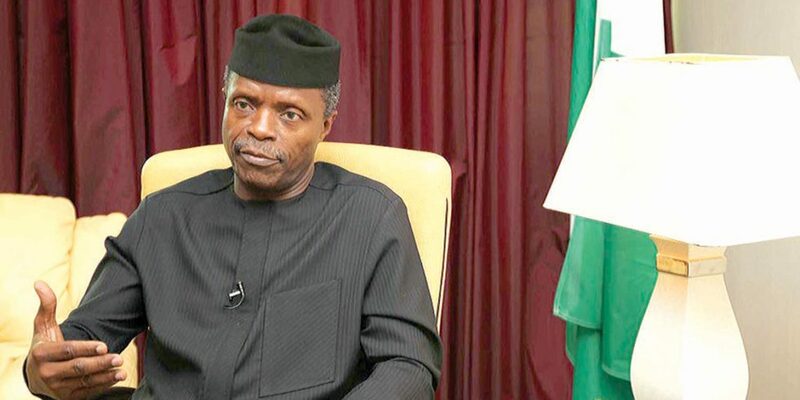 VICE President Yemi Osinbajo yesterday called on Nigerians not to allow reckless utterances and actions of some people, who are playing on the countryâ€™s religious and ethnic fault lines to threaten its unity. Osinbajo spoke during the Interdenominational Church Service for the 2019 Armed Forces Remembrance Day celebration in Abuja. According to him, the supreme sacrifice paid by the nationâ€™s military should not be allowed to go in vain. Reflecting on the resurgence of attacks by Boko Haram sect, which recently claimed the lives of several dozens of soldiers, Osinbajo said the era of the terrorists holding local government areas and hoisting their flags has gone. The vice president also appealed that the families of the gallant military officers that sacrificed their lives in the bid to secure the territorial integrity should not be allowed to suffer. He said: â€œToday, again we participate in an annual tradition of remembering and honouring our departed military heroes. This particular remembrance day is perhaps more poignant than any other. â€œIn the past few weeks, we have buried 13 soldiers and one officer, and just last week, two Air force pilots and three airmen; all these men died in battle fending off Boko Haram and ISIS West Africa terrorists in the Northeast of Nigeria. â€œIn the past few years, we have seen patriotism at its highest. Our valiant men and women of the armed forces have destroyed the backbone of Boko Haram, who once attacked Abuja, Kano and Kaduna with impunity and hoisted their tattered flags over 17 local governments in the Northeast. â€œToday, both Boko Haram and ISIS West Africa operate as small even if deadly guerilla bands in parts of Borno State. But in these battles we have been sharply reminded that indeed â€œfreedom is not freeâ€. . That peace is often paid for with blood and gore. Hailing the dead soldiers for dying on line of duty, he said: â€œWe are grateful that they were faithful to the cause, that they did not betray the trust of millions, that they gave up all the comforts of life and the love and affection of family that we may enjoy the same. â€œOur posthumous thanks to them and their families, who not only bore the fearful apprehension of their going to war, but also the heartbreak of their deaths. â€œBut our gratitude must also mean a commitment to ensuring that their families are cared for, that their children do not ask why the sacrifices they made were made at all. â€œAlso important is to ensure that they did not die in vain. This unity and territorial integrity of the nation for which they died must not be jeopardised by the reckless utterances and actions, which play on the religious and ethnic faultlines of our nation. â€œThe ordinary people of Nigeria have demonstrated time and time again that they share common problems and a believe in common destiny. The desire for food, shelter, clothing and decent jobs does is unblinkered by tribe, tongue or faith. Our unity and peaceful coexistence is the best tribute to our fallen heroes. The first Scripture Reading was taken by the Chief of Defence Staff, Gabriel Olonisakin, from Isaiah 43:1-13. The Speaker of the House of Representatives, Yakubu Dogara, took the second Scripture Reading from the book of John 10:1-18. During the service, there were intercessory prayers for the country. A special rendition was made by the Armed Forces Christian Women Fellowship. The Military Mass Choir also made a presentation. Those who attended the church service included Secretary to the Government of the Federation, Boss Mustapha and his wife, and the Chief Justice of Nigeria, Walter Onnoghen.